I decided to celebrate Picture Book Month by plucking a few of my favorite picture books from my bookcase(s) and sharing them. 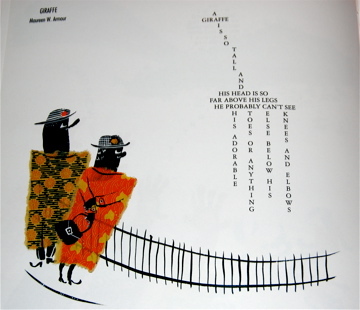 A Poke In The Eye, a collection of concrete poems selected by Paul B. Janeczko and illustrated by Chris Raschka, is a delight. 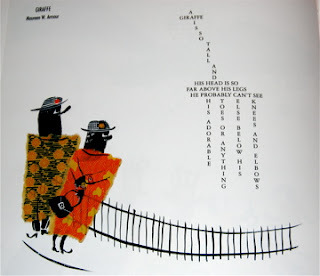 You may know concrete poems as shape poems—poems where the words or letters of the poem are placed in a particular pattern that echoes the content. 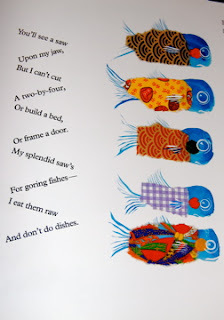 This book is a playful introduction to poetry with simple but amazing illustrations. A torn piece of patterned paper with a few brush strokes becomes a fish or a twirling child. I would definitely try writing concrete poems with children and providing paper, paint and glue to try Chris's style of illustration. OK. Eye in the title should be the letter I. I give myself a headache. Also, the fish poem is The Sawfish by Douglas Florian, one of my favorite poets.The other poem is Giraffe by Maureen W. Armour.I am going to take some aspirin now.